Free will comes to the fore in the fifteenth century tapestries The Lady and the Unicorn, deemed one of the greatest artworks of that time. One of the pieces is called A Mon Seul Désir. The translation My One Soul Desire can be interpreted as By My Will Alone. Then the desire of free will becomes - in the context of these six tapestries - the sixth sense, alongside the other five. 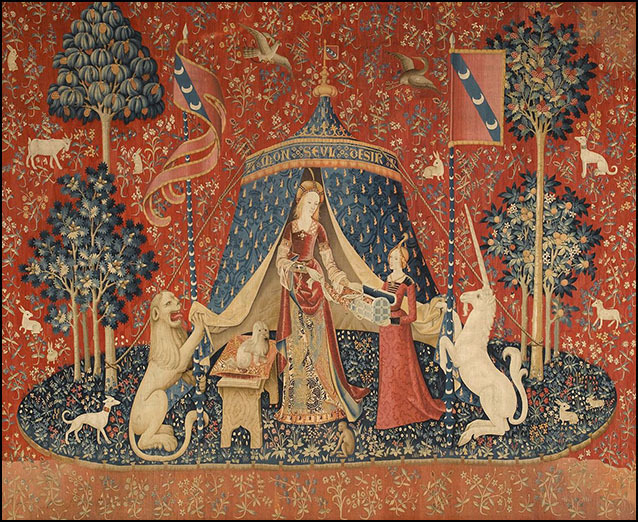 The exhibition of the six tapestries The Lady and the Unicorn is currently on view at the Art Gallery of NSW, normally on display in the Musée national du Moyen Âge (former Musée de Cluny) in Paris. I have an essay FREE WILL in my book en.light.en.ment.